Scorpio zodiac predictions for 2014 show high levels of activity both on the personal and professional front for this year. The time is perfect for travel. Single Scorpions will be happy in love. Your work life will prosper. Financially you may have to be a little careful with what you have. All you need to take care of is not to doubt yourself. The 2014 Scorpio love horoscope forecasts that singles might find love this year. If there are areas that you feel need to be perfect a discussion with your partner on November 3 will be advantageous. Their words of wisdom will guide you to true joy. Some special time with your beloved is predicted. April 8 would be the best time for this break. The conception of children will be successful presently. The change you thought might be necessary must occur now. Any misstep on your part will be viciously attacked. The weight of your duties may make you feel older. Although it is totally inappropriate depression and the sense of being unloved may surround you. When your best personality traits are pointed out you will feel very special. Through an event you may learn more about your children. 2014 Scorpio career forecasts foretell that you may be put off or question your abilities between March and July when Saturn is retrograde. The clear-sighted aspect of your personality is the key to progress although you may have concerns that some of your concepts may be received negatively. Goals may not be easy to reach. Accept criticism gracefully, and remember that at the moment your leadership skills are depleted. Your presence at work will be boosted by the presence of Jupiter in your House of Career from mid-July 2014 through July 2015. Update resume, speak to people in job placement. If you do request to move to the next level have your boss go over your accomplishments with you. Your ability to create an effective demonstration of your work may bring you to the fore within the company or to begin a new endeavor on your own. If you do go out on your own be certain that you have proper PR created. On July 24 any significant discussion will succeed as every aspect is favorable including time and place. A more subtle approach would be the appropriate one on either September 25 or in mid-August. During December few things will happen as planned as Jupiter is retrograde at this time. February 2015 will be the time when these concerns will be fulfilled. 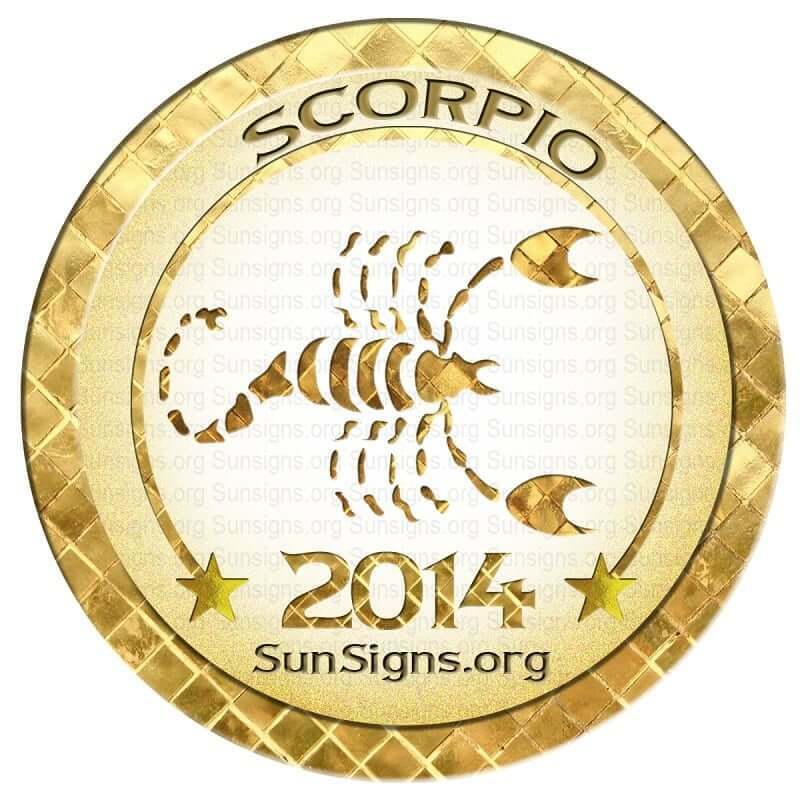 Scorpio financial predictions for 2014 forecast an improvement over 2013. You may need to be somewhat careful with your bills but if you do this the year will go well. Your worrying will make you feel older. Saturn may have caused you to age early. If you love loud headphones, you may face difficulties with your hearing. When you believe in yourself you are gifted by Saturn with greater authority. To keep looking your best reach your ideal body weight in 2014. January will see a good balance of family and career. February will have you making important financial decisions. March will be a very busy month. Love, family and entertainment will be high on the cards. April will be a progressive month for career and finance. May will be a difficult month with some family issues. In June you might need to reassess your future goals. July will be a good month for health. Learn to speak your mind. August will be a spiritually healing period. Major career decisions will need to be taken in September. Expect stress in October with respect to health and money. November will be a financially rewarding period. December will have you keeping your feelings and emotions in check. The 2014 horoscopes for Scorpio will aid you in planning your year so that it will go smoothly. Use this annual horoscope as a guideline for a better future.